When the first Galaxy Tab S4 renders showed up, the lack of a fingerprint sensor anywhere on the device left only one logical explanation: That Samsung would be employing an iris scanner instead. After all, the company wouldn’t launch its new flagship tablet without any sort of security feature other than the software ones that come as part of Android, right? 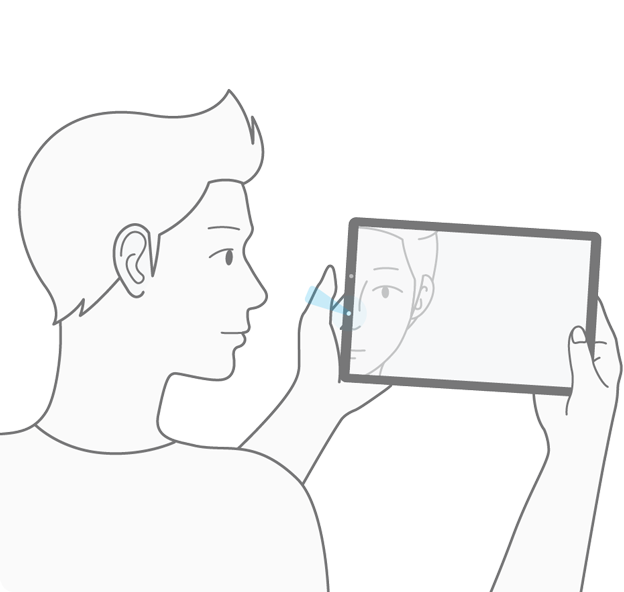 We were later able to confirm the presence of an iris scanner on the Galaxy Tab S4 thanks to our insiders, and if you needed more proof, the instructional video below should be enough. We have extracted this video from the official Galaxy Tab S4 firmware that is now available on the SamMobile firmware database. It’s the same animation that plays when you’re setting up Intelligent Scan on the Galaxy S9 or S9+. For those unaware, Intelligent Scan combines the iris scanner and facial recognition when unlocking the device. If one fails, the other is used as a backup. For example, since the iris scanner has issues working in harsh sunlight, Intelligent Scan switches to facial recognition. The reverse is true for usage in the dark, where facial recognition usually fails to work. It’s only a matter of time before the Galaxy Tab S4 is made official now that the first firmware is available (based on Android 8.1). The Tab S3 was announced earlier because of the Galaxy Note 7’s demise, but the first two Galaxy Tab S tablets were launched in July, and the same may happen this year. If you’re interested, we have all the wallpapers of the Galaxy Tab S4 available in our wallpaper archive for your viewing and downloading pleasure. What do you think of Samsung opting to remove the fingerprint sensor on the Galaxy Tab S4 and only going with iris scanning? There will also be a fingerprint scanner in the S-pen, it’s not only iris/facial scanning. What I hope this means, is that the facial and iris scanning works in both rotations?! That would be a welcome addition to the Note9 iris scanner and maybe come to the S8 and S9. This stupid bezel-less trend claims a new victim. No buy from me. same here. The Iris scanner in the Note 8 just doesn’t work very well and is considerably slower than placing your finger on a sensor. It seems that would cause a problem with certain apps. I have a lot of apps like banking software, password manager, etc. that support fingerprint access, but not iris scanner.